Writing plays is more exciting and comes more easily to me than writing novels. The reward – that is seeing one’s words performed before a live audience and hearing the applause – is amazing. When you write finis at the end of a novel the silence is deafening. Listening to the gossip and hearing the audience’s opinions of Act One in the interval of your stage play is one of the perks. 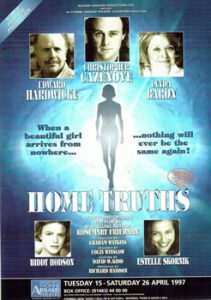 My first play Home Truths (1997) started life at the Theatre Royal, Nottingham, before going on to `number one venues’ such as the Yvonne Arnaud Theatre, Guildford, the Churchill Theatre, Bromley, the Theatre Royal, Lincoln and the Opera House, Manchester. The talented cast included Edward Hardwicke (son of Sir Cedric), Christopher Cazenove (of Dynasty fame) and the talented stalwart of the the theatre Lynda Baron. “…always interesting….. worth seeing.” Darlington and Stockton Times. Change of Heart (2004), based on the real-life story of Professor Dame Julia Polak who received a life-saving heart-lung transplant from the hands of the renowned surgeon Professor Magdi Yacoub, raised the profile of those life-threatening illnesses which required urgent transplants. It was instrumental in raising funds and attracting organ donors as did my novel on the same subject Intensive Care. The excellent cast included Julie-Kate Olivier (daughter of Sir Laurence Olivier and Dame Joan Plowright). An Eligible Man (2008) based on my novel of the same name, premièred in London and has so far had 2 successful tours (including one in Poland) with a third in the offing. The original production starred Graham Seed (Nigel Pargeter from The Archers) and a wonderful supporting cast. Attending rehearsals and hearing one’s words come to life in the mouths of the actors, not to mention seeing one’s name in lights and on posters (in the case of Poland all over town) is an exhilarating experience and ample reward for the lonely days slogging away at the computer. “…constant interweaving of pathos and wit is wonderfully adroit… some pungent things to say about bereavement… of West End star standard. … a play that holds one from beginning to end.” Francis King (former Sunday Telegraph drama critic).